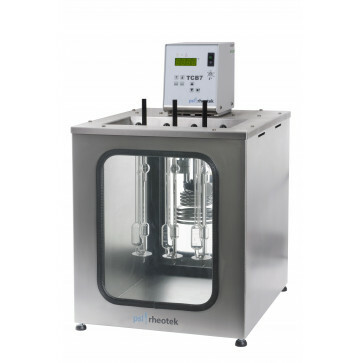 Stirred liquid bath, Suitable for kinematic viscosity, solution viscosity and density testing. Other voltages available. The TCB-7 bath is very easy to operate. Using the touch pad on the control unit, the set-point is keyed in. The set-point can be programmed and calibrated to two decimal places. Thermometer holder for precision thermometer is built in. Safety features include a low liquid level switch, an upper temperature limit warning, a low temperature limit warning and a high temperature cut-out device. The bath construction affords full visibility of up to 7 viscometers, which can be placed in the bath simultaneously. The TCB-7 bath can be used from 15 to 150°C, and is supplied with a built in cooling coil. Operation at temperatures from 15ºC to 40ºC require an external source of chilling. This is provided by a cool liquid, which is passed though the cooling coil. A low cost recirculating chiller is available from PSL to provide the cooling required. The PSL Rheotek TLC-250 Chiller is specially designed for operating with the TCB-7MkII bath. All TCB-7 baths are supplied with a certificate of temperature stability and uniformity. Excellent circulation technology provides superior uniformity.